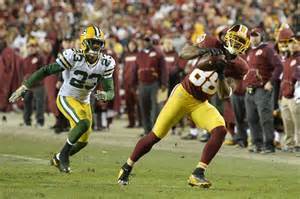 Here are some of the numbers that helped define the Packers 42-24 loss to the Washington Redskins on November 20. The Packers are now 5-5 in their last 10 night games. This is the first four-game losing streak for the Packers since 2008. They had the second longest time-span of not having a four-game losing streak coming into yesterday’s game. The New England Patriots top the league… they have not had a four-game losing streak in a season since 2002. The Pack was scoreless in the first quarter. They are 3-9 in the last 12 games where they did not score in the first quarter. The Packers were behind 13-10 at halftime. In the last 11 games where the Packers scored 10 or fewer points in the first half, the team is 2-9. Green Bay was behind 22-10 going into the fourth quarter. Since 2010, they are 1-17-1 in games when they are behind by 10 points or more entering the final quarter. Packers tight end Jared Cook had six receptions for 105 yards, his fourth career game with 100 or more receiving yards. His teams are 2-2 in those games. Washington QB Kirk Cousins had a Quarterback Rating (QBR) of 145.8 in the game; that is the fourth highest QBR of an opposing QB versus the Pack in the Mike McCarthy era. The Packers are now 0-16 since 2006 when the opposing QB has a QBR of 120 or above. Redskins receivers Jamison Crowder and Pierre Garcon each had over 100 yards receiving in the game, the first time a pair of opposing players both went over the 100-yard mark in receiving yards since 2012 when the Lions had a pair do so. Redskins rookie running back Robert Kelley had 137 yards rushing in the contest. The Pack is 31-36-1 when an opposing runner goes over 100 yards. He was also the fourth rookie since 2013 to gain 100 yards rushing against the Packers. The others: Ezekiel Elliott, Todd Gurley and Le’Veon Bell. Kelley also had three rushing TDs in the game. He is the third running back since 2000 to have three rushing TDs versus the Packers, and the second rookie to do so since the Lions’ James Jones had three rushing TDs versus the Packers in 1983. The Packers “D” did not have any takeaways in the game. The team is 4-19 since 2006 when they have no takeaways in a game. Aaron Rodgers had over 300 yards passing, three TD passes and no interceptions for the 28th time in his career. He passed Brett Favre for fifth place all-time in this stat. Drew Brees tops the list with 56 games with 300+ yards passing, three TD passes and no interceptions in a game. Green Bay allowed 40 points in a game for the second time this season. The Pack in 1986 and 2004 had three games where they allowed 40 or more points, most since 1970. They allowed 40 or more points twice in the 1980, 1983 and now the 2016 seasons.